How can regression version of machine learning models like GBM, Neural networks etc be used to predict days till occurrence of an event? I believe just using days till occurence as target variable and simplying running a regression model will not work? Why wont it work & how can it be fixed? Can we convert the survival analysis problem to a classification and then obtain survival probabilities? If then how to create the binary target variable? What is the pros & cons of machine learning approach vs Cox Proportional Hazards regression & Kaplan-Meier models etc? The sensor pings the data at intervals of 10 mins but at times data can be missing due to network issue etc as represented by the row with NA. var1,var2,var3 are the predictors, explanatory variables. 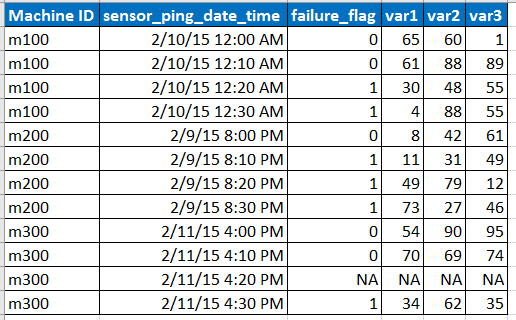 failure_flag tells whether the machine failed or not. Note: I want to predict the probability of failure for each of the machines for the next 30 days at daily level. For the case of neural networks, this is a promising approach: WTTE-RNN - Less hacky churn prediction. The essence of this method is to use a Recurrent Neural Network to predict parameters of a Weibull distribution at each time-step and optimize the network using a loss function that takes censoring into account. The author also released his implementation on Github. Also note that traditional hazards-based models like Cox Proportional Hazards (CPH) are not designed to predict time-to-event, but rather to infer variables' impact (correlation) against i) observations of events and, hence ii) a survival curve. Why? Look at the CPH's MLE. Hence, if you want to more directly predict something like "days till occurrence", CPH may not be advisable; other models may better serve your task as noted in the above two references. So you create rows of data, for each sample that survived till time t-1, did it die at time t (0/1). So now the probability of surviving up to time T is the product of p(don't die at time t given didn't die at t-1) for t=1 to T. Ie you make T predictions from your model and then multiply together. Note in you case you could model at 10 minute interval or aggregate up the classification problem up to day level..
Not the answer you're looking for? Browse other questions tagged machine-learning classification survival cox-model kaplan-meier or ask your own question.